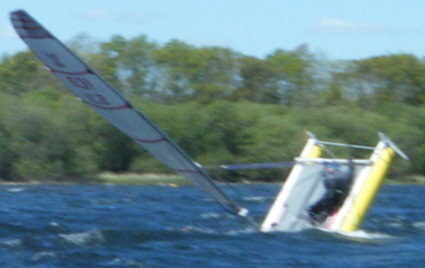 It goes without saying that the quicker you can recover a capsize, the less chance you have of the boat completely inverting. Knowing what to do is really important, as well as practicing at least once per season. The first step is to release the control line from the cleat on the high hull, and then lengthen the shroud to this hull so that the hull moves from overhanging to lying back. This means shortening the shroud to the hull in the water until the blocks are close or touching. Jon's preferred technique is to steady your foot against the front cross beam bracket whilst floating in the water. "This gives you some purchase to enable the mast heel lines to be un-cleated. Firmly hold the mast heel line close to where it exits the triple block, so when releasing the line from the cleats you have full control. Pull the control line until the triple blocks nearest to you in the water meet, then the mast should be fully to one side of the boat." George below left (at Rutland in Force 7 gusts) has achieved this, and (below left) is climbing the slope of the trampoline. Jon preferred to stand on the hull just forward of the front cross beam and gently pull the boat back upright, just by leaning a little inboard. As Jon comments. "All that�s left to do then is adjust the mast heel lines to centre the mast, figure out which way the next mark is, then continue sailing!" 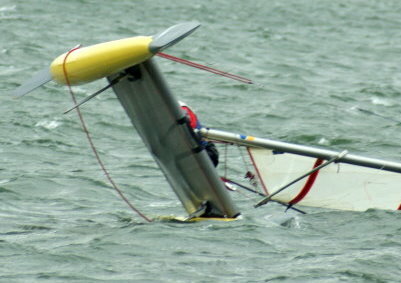 "If the boat turns completely mast down, it is still possible to recover the capsize. Swim to the triple blocks on either side of the boat. Pull the mast heel control lines to shorten the triple block nearest to you. Mast buoyancy will start to lift the hull nearest to you � but it will take a little time for the water to drain from the hull beam. Be patient and if you have sufficient personal buoyancy to enable you to help lift, so much the better. Once the hull is airborne, it is necessary to move the mast heel control lines fully through the system, so the mast is canted to the other side of the boat. 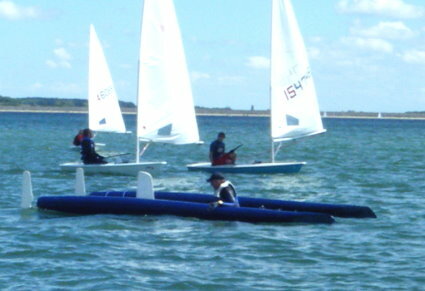 The helm can then climb onto the hull and use weight to right the boat, as described earlier. Safety note � With an inverted mast and a lumpy sea, the mast ball can be jerked out of its seating. It is therefore important to tie the mast to the cross beam." John Montgomery (designer of Catapult) summed this up: The shock of discovering you have a leaky mast is bad news. The answer is to make sure you fully invert the mast at the start of the sailing season. A tremendous amount of water pressure is trying to get past the seals, so it�s a job to be taken seriously. Testing is not simple so it may be best to form a plan with other CCA members so several test at the same time and a rescue boat is around should anyone get into trouble. Some coaching could also be provided from those who have done the process before! The original round masts were sealed with cork. Topper used Polythene foam. Anodised aluminium doesn�t give sealants much of a chance to key to the surface and the odd failure has been known. I think that top mast seals would give trouble first. My plan would be to strip out old seals and replace with 12mm thick marine ply interference-fit plugs, with sealant for added security. 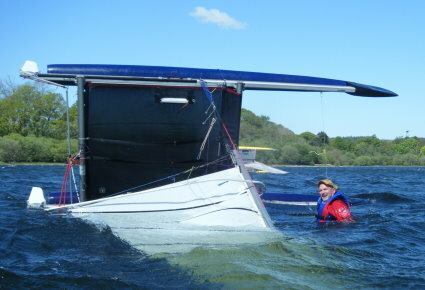 Below: The aftermath of Alastair�s capsize and failed righting efforts at (Bewl, April 2015.) He has had time to think of the lessons, while drifting to shore and getting safety boat assistance. -- Tie the mast foot tightly down into the socket; the strong forces with the mast fully canted while capsized eventually flipped it out. -- Ensure that the topmast is fully watertight; in the slow recovery, the mast leaked, and finished any possibility of recovery. -- Know the righting sequence so well that it can be done quickly when upside down, and in the water.This means knowing the overall plan, the exact ropes to access, and where they will be with the boat over or on its side. Jon Montgomery: Too tight and line doesn�t move easily between the four triple blocks and two turning blocks and freeing the control line jam cleats can be tricky. Too loose and line can loop aft and get caught in feet when tacking which may trigger the cleats to release. This is annoying as the mast will heel rapidly until one side�s triple blocks meet. 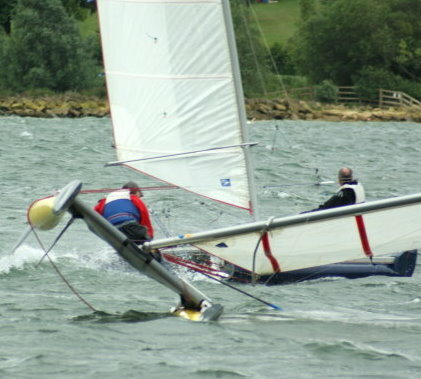 Extra slack and the mast will heel to a dangerous angle and risk the mast ball levering out of its seating. The forestay bridle with its block and soft line allows slack into the system whilst heeling the mast to port or starboard (but notice that when the mast is heeled towards its maximum, the system tightens up again). The length between the block stops determines the amount of introduced slack when heeling the mast and a distance of 480 mm is recommended. A good way to assess how much slack you have in your system is to set the mast upright, with the shrouds cleated as though you were sailing. The amount of slack in the system can then be measured by stretching a light line across the deck from cleat to cleat. This gives a reference point to measure slack in the mast heel control lines. Measure how far aft the control line stretches. About 550mm aft slack is about maximum. Remember that a wet line may stretch a bit. Incidentally, when the mast is heeled to the maximum, the dimension of the extended triple block should be 1.25m, giving a mast heel of 40 degrees. You will notice that the top of the mast ball has around 3mm clearance to the cup � so any additional mast heel will lever the mast ball out of the cup!